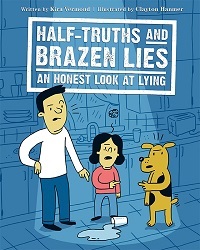 CM Magazine: Half-Truths and Brazen Lies: An Honest Look at Lying. Half-Truths and Brazen Lies: An Honest Look at Lying. When cheaters get an A, they feel smart and believe they�re better students than they really are. In reality, they�re getting further and further behind other students without knowing it. Caught in a lying loop, they�re setting themselves up for a big fall when a future teacher makes cheating impossible. Suddenly it becomes obvious how little the student actually knows. Thousands of schools and universities around the world are using computer software to make sure students aren�t plagiarizing essays and papers. (Plagiarism means you are passing someone else�s work off as your own- serious cheating). In Britain alone, more than 45,000 university students were caught cheating between 2009 and 2012, partly because professors had new software to catch them. Vermond�s new book about lying is really good. Should you believe me? Why would I lie to you? How would you even know? And what are the consequences to myself and others if I choose to lie? The studies and opinions shared in the four chapters in this nonfiction book try to answer these questions. The book begins with an April Fool�s Day joke about spaghetti bushes that was televised on the BBC in 1957. Reading about why it was told and how some people reacted, we are asked to think about the difference between truth and lies, and when is it better to lie than tell the truth. After giving four reasons and examples of why we lie, there is a chapter about men and women who lived much of their lives lying (Lance Armstrong) and the different ways people have tried to detect liars (Polygraph machines, and P300 tests). The real-life scenarios about lies that go on at school, home, and in advertising will resonant with children because they are common occurrences (cheating on tests and in video games). Despite the glum subject, the book ends on a positive note about how trust and honesty build better, happier communities. Hanmer�s cartoon-style illustrations add humour and help lighten the mood of this grim topic. Children, animals, and adults are all shown exaggerating their lies. Their sweat is visible, and so is their dishonesty. Different cultures are represented and the material is broken up into a variety of formats (sidebars, boxes, lists) to make this an easy read. Some of the liars have green skin which matches what the author says about how lying can make us sick. Back material includes an extensive index, and bibliography, after which the author thanks her sources. Vermond also authored The Secret Life of Money).